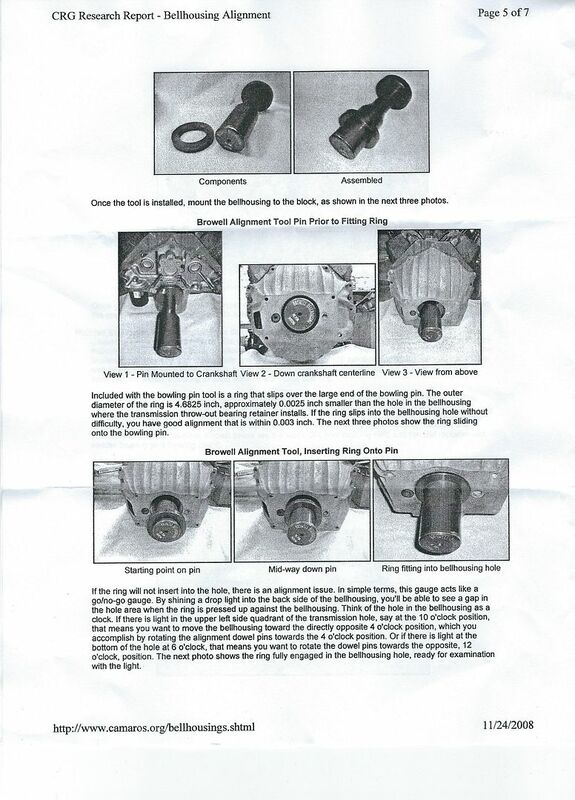 It's 3 pages straight from a CRG Research Report on bellhousing alignment! They probably figured why reinvent the wheel when it's already done. And probably in more detail than they would have provided on their own! Who's TKO swap did you use? I went with Hurst Driveline Conversions. I guess what I liked was the completeness of the kit and a nice menu layout to check or uncheck items that you don't need or want. Cool. Hurst is who I deal with. I've done several Vettes and Mustangs from them. I haven't seen the Camaro kit. How do you like it so far? How complete did you buy it? They are touted as having a correct shifter for console use etc... Wondering if you went that route. Would like to hear how it shifts for you behind a high strung small block. So far so good. I got most of the kit but skipped any of the clutch options. My clutch/pp was already new so all I did was buy a 26 spline disc. Yes, I got the Blackjack TKO shifter for the 69 Camaro and the round stick. Hopefully it will look stock from inside the car. A good friend of mine runs one of the top race transmission shops in the country, so the trans went straight to him when I got it. It's been upgraded with everything you can do carbon blocker rings, all internal gears and shafts micropolished, and other stuff I don't even know, so it should be good to go. He says it's much better than stock for high rpm shifting, etc. Struggling a little with the pilot bearing. 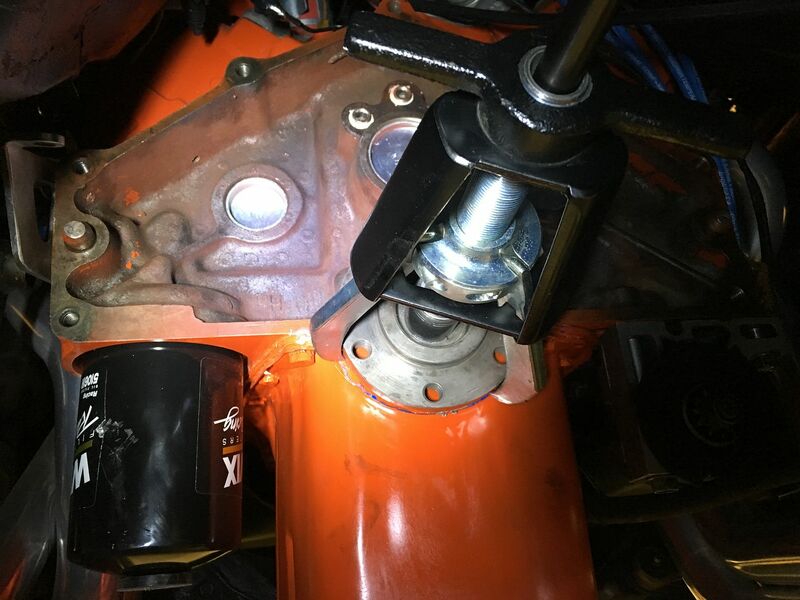 I installed the first one the same way I install the bushings; I use an input shaft and a hammer. I didn't like the feel of the bearing after that so I pulled it out and then pressed in the next one. I don't like the feel of that either. It takes too much pressure to slip the input shaft in and pull it out. Thinking about just going with a bushing like normal. Any tips welcome! Here's the Browell tool installed on the engine. The black ring is such a close tolerance to the ID of the bellhousing hole I gotta say I was pleasantly surprised to bolt it all up on the engine and see the ring slide right into the hole! I had figured that with 1969 technology some adjustment would be needed. Here is how I set up to press the pilot bearing in. 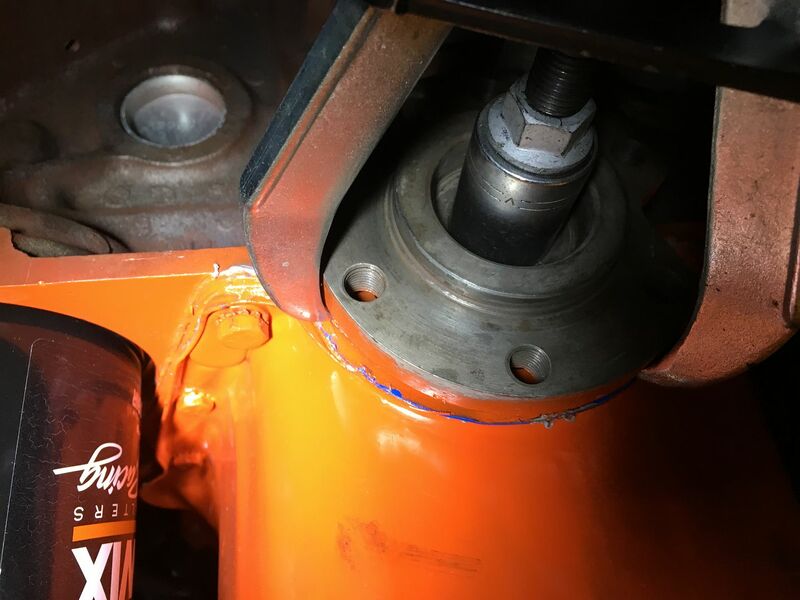 It felt smooth going in, but afterwards I feel I am distorting the bearing somewhat because it's a lot harder to get the input shaft to slide into it, than it was when the bearing was loose in my hand. Since everything checked out nice and true, would it be a big deal to just use a pilot bushing instead of the recommended bearing? Always used a bushing, tap it in and done. Bearings seem to have issues. Never aligned a bellhousing on a clutch install. Guess the tool people are happy and making money. I never use the bearings in any of the swaps. I always go straight for the bushings. Much more forgiving when you're sliding the trans in, and I don't like the idea of little needles in there, seems like a failure point to me that would make a mess. I probably have at least 10 or 12 of those bearings new sitting here because they always send one, even when I tell them I don't want it, lol. Yes when talking with Hurst we discussed the Black Jack shifter for my Z. At the time there was someone that worked at the company with a 69Z that was using it (may still be there??) and told me it was the shifter to use with a 69Z console setup and worked beautifully. The one thing that has held me back is that Hurst didn't offer any internal (high rpm) upgrades for the TKO. However American Powertrain and Silver Sport Transmissions does. I'm reluctant to use Silver Sport for reasons I'd have to PM you about, (caught up in the Keisler deal). Bell housing alignment is key to smooth shifting. 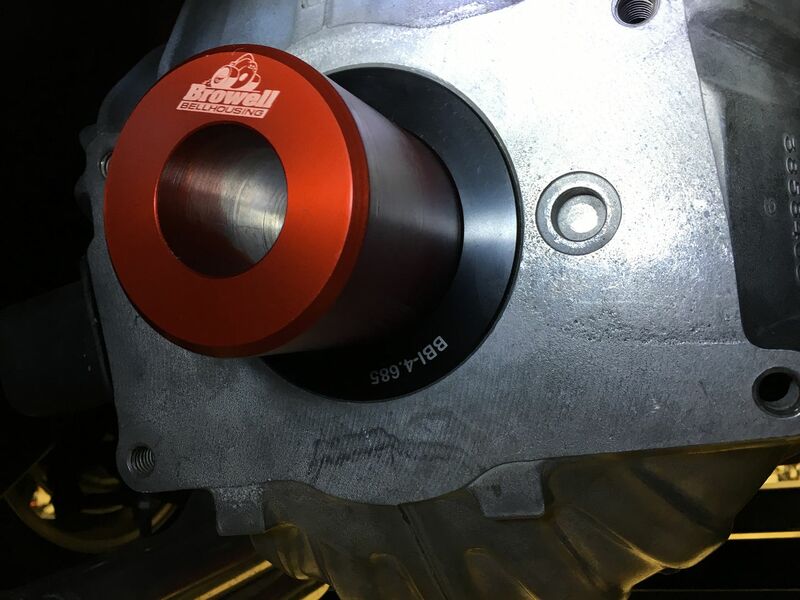 The bearing is likely more precise in alignment than a bushing, but if the bellhousing is true the bushing does an excellent job. The Browell tool is very cool and easy to use. I don't have one here, I've always done the dial indicator method, which is a little more time consuming but works just the same. I'd love to see pics and hear your thoughts on the shifter and how well it works when you get the time. Great! I'll put a bushing back in and move on. I'll update with pics when I get there. Thanks for your input! Gramps: Agreed, in all of the clutches I've done over the years with Muncies and Saginaws I never worried about alignment either, but the TKO is a more modern close tolerance transmission, and they say it's critical that there is no off center loading on the trans. So there are good reasons (IMO) that they make these tools and offset dowel pins for the block. And I don't see adjustable dowel pins in your picture so I assume your bellhousing lined up nicely Good deal. Correct, it turned out that I didn't need anything, but I had bought a set of the adjustable pins just in case. The go/no-go tool is good for a quick check indeed. I have a Coleman Racing bellhousing alignment tool, which is an equivalent of the Browell's, I got off Ebay for $50. When I put it on my bellhousing, I could not get the ring through the bellhousing opening so I knew something was out of alignment. I then bought a dial indicator gauge w/magnetic base and took measurements and found the factory bell-housing was .011" out of alignment. Factory specs are .005" max. I was able to move the housing towards 2 o'clock using offset dowels to lower down to a .002" offset. While it's nice to have a go/no-go tool, using the magnetic electronic dial indicator method is pretty easy to do once you try it. You can also check deck squareness too with the dial indicator, which is something you cannot do with the Browell's type of go/no-go gauge. Attached is a photo of the feeler gauge in the lower left corner of the block. Probably from age and block core shift, the bellhousing deck squareness was off by .004". A shim was used at the 7 o'clock position to square the bellhousing deck until a 0.0" squareness offset was reached. After all was aligned, the Coleman tool ring slid through the opening perfect, and the transmission slid in so easy. Before I found this alignment was out so much, I used to go through pilot bearings often, including the roller type. I'm back to using the factory proven bronze bushing. Great info Mike, thanks for sharing, especially about the squareness. Parallel alignment, or squareness as Mike states, affects the concentric alignment. Parallel must be corrected before an accurate concentric reading can be taken. Jody's Transmissions will not warranty his trannys unless this procedure is documented. Buy a box of stainless shims. 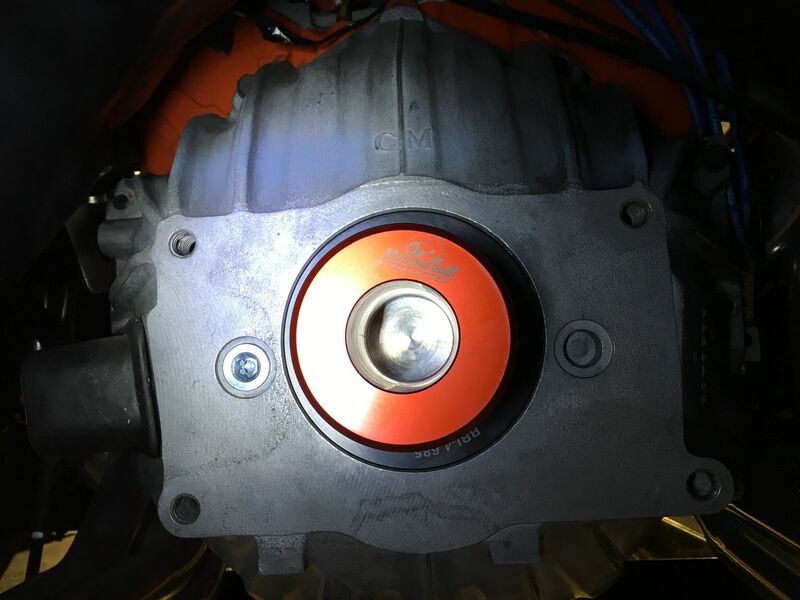 It is the inconsistent machining of the block and bellhousing that causes problems.